Early in my career, at my first studio, I experimented with Polaroid image transfers. I was working with a 4/5 Noba Studio camera($500.00) and a Heliar older style lens($250). 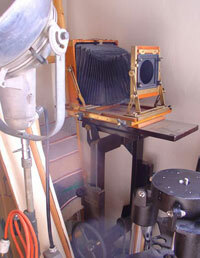 Image left: The Noba stand shown in this photo has a 8x10 Rajah retrofited. Normally, the Noba body and Heliar lens would have been on it. The stand is on wheels, and has a crank which raises and lowers the camera body, allowing for fast portrait work... not having to deal with finicky tripods. This camera/stand is no longer in my main line of equipment. Image right: Photo of the Noba 4/5 camera with 30CM, 300mm 4.5 lens. Notice the air inlet for the pneaumatic bulb ( soft squeeze gives you 1/10 sec exposure and hard squeeze gives a 1/25 exposure. The electric cord gives me a X' sync. The 300 Heliar gives a sharp focus on the image plane, but softens considerably in foreground and background. It has a special quality of diffusion. 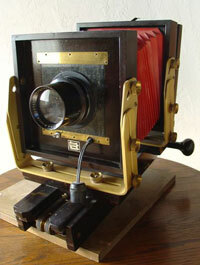 The shutter that works behind the Heliar lens is a packard shutter. This is controlled by an air bulb... which will give a consistant speed shutter but is definately not mechanical. I would encourage participation of clients on Downtown Saturday Nights the local arts walk. I offered to do three transfers for $15, they would keep two, and I would keep one. I got to make the first selection. This was 15 years ago, so price was not too out of line. Doing it like this, I got to build a portfolio of polariod image transfers quickly. Two of them are showing here. I would do a warm transfer on the back of a light box, using Arches paperfor a full laydown, or use Cranes stationary paper if I wanted a more abstract version, with more lift. Shooting direct 4x5 type 59 film in a polaroid holder gave me a sharpness in the final image that I have not been able to get through enlarging a smaller negative. or visit Gary's home page.